Wouldn't it be amazing if you could write the movie script for your own life? I guess it would have lots of boring bits. But at least you could write yourself a happy ending. Thirteen-year-old Henry never meant to keep a journal, but reluctantly gives it a try when his therapist suggests it. It has been months since IT happened. Since his whole life changed, his family fell apart, and Henry stopped trusting people and started keeping secrets too big for any one person. Now he and his Dad live in a shabby apartment in a new city where Henry is determined to stay under the radar at a new school. But with the help of an oddball group of kids at school, and the other misfit tenants in his apartment building, Henry slowly begins to face IT, heal emotionally and trust people again. The Reluctant Journal of Henry K. Larsen is one of those books that I would never have read had a friend not recommended it, and then left it pointedly where I would find it. Now that I have read it, it’s one of those books that I think should be required reading for anyone who spends time with teenagers, whether at home or work. It’s one of those books that is so phenomenal, so profound, that I hardly have words to describe it. If a keysmash could be considered an adequate review, that is how this one would end. For all that this is a book about the aftermath of personal tragedy it is surprisingly funny and uplifting. Henry has a unique outlook on life and a journal-writing style that is by turns comical and perceptive. Despite what happened, Henry is still a thirteen-year-old boy. His reactions to the situation, his new neighbors and new friends, and his possible first crush are typical of a middle-school-aged boy: awkward and juvenile, yet sometimes insightful. And his almost religious love for the ‘Saturday Night Smash-up’, is refreshing, significant, and the perfect bridge connecting Henry to many of the people he meets. Nielsen has also done a wonderful job creating fully-developed secondary characters, adults and fellow students, each of whom has a part to play in helping Henry heal. There is so much that I wish I could write about in-depth, but it’s impossible without spoilers. I don’t want to give away IT, because I think part of the beauty of this book is seeing Henry come to terms with what happened and slowly open up to the people around him. It’s watching Henry reconcile the people he knew with their actions. It’s Henry trying so hard to avoid talking about IT, that he inadvertently gives both readers and his new friends glimpses of the tragedy that toppled his carefully constructed life. And, ultimately, it’s Henry coming to the understanding that even though life can never go back to the way it was, he is still entitled to happiness. 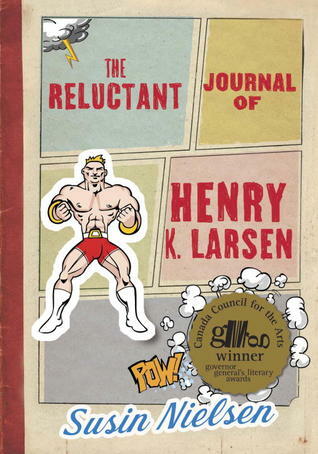 The Reluctant Journal of Henry K. Larsen is a beautifully written book that addresses an important subject with understanding, humor and compassion. Highly recommended to teens and adults alike.